Our two room suites are a good choice for couples looking for a special getaway, or families that need a little more space to spread out. With full equipped kitchens, a separate sleeping and living area, suites are a perfect blend of function and form. 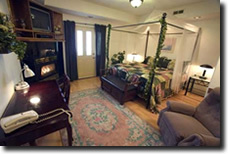 Sleeping arrangements include a king bed in the main bedroom, with a day/trundle bed in the living room area. Rates quoted are for single/double occupancy. Add $15 each additional person. Please add 8% bed tax to prices. Geese, Tripods, and Green Grass–oh my!